Hi, friends! As promised, I’m back today with another printable for your wintertime home! And, this time, it’s FREE! I decided to keep my gallery wall that I created a little before Christmas, but the NOEL print that I shared at that time, was definitely Christmas themed. The rest of the gallery wall was more of a wintertime theme. So, what is easier than swapping out the NOEL print with something similar – a SNOW print! I used the same font and style, because I loved the NOEL print so much! It’s a simple black and white graphic that you could use just about anywhere in your home. 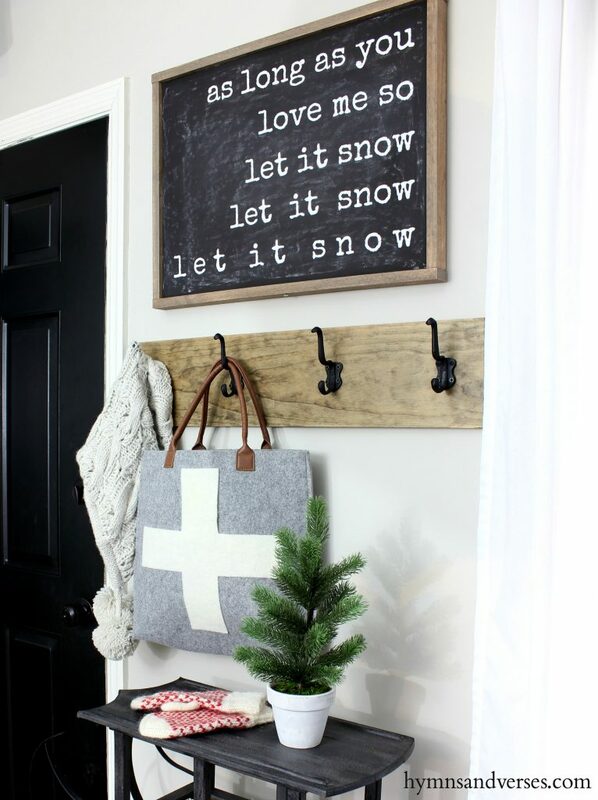 Pop it into a black frame with a white mat and you’ve got a some instant wintertime decor for your home! 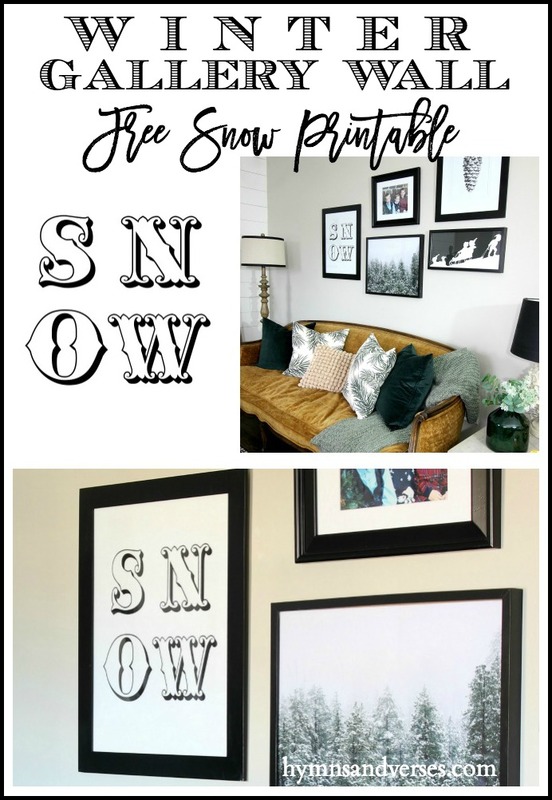 The SNOW printable is available to my email subscribers in my FREE printable library! You can enter the library by following the link in my blog sidebar! This post contains some affiliate links for your convenience. Please see the full disclosure at the bottom left side of this page. I also wanted to share a few more winter accents that I added to my living room space this year. Right after Christmas I made a trip to Ikea for a few things and I picked up this terrarium. I added some moss to the base and a couple small birch branches and finished it off with a few smaller, realistic faux plants. Of course, real ones would be great too! Actually, I prefer real, but I found this amazing small faux orchid at a local shop that looked so realistic and I already had the small faux fern, so I just used them. I am thinking about spray painting the white frame of the terrarium with a flat black paint? I think it would provide more of a contrast with the white orchid and the white door backdrop? That means I will have to take it apart, but it’s not hard. Thoughts? And, here’s my front entry with another new large scale printable. It’s one that is typically used at Christmastime, but I think it’s perfect for the upcoming Valentine’s Day holiday – “As long as you love me so, let it snow, let it snow, let is snow”! This printable is sized as an 18″ x 24″ black and white chalkboard print that you can have printed at your local office supply store as an engineering print – like I described in yesterday’s post with the “My Favorite Things” print. I believe I had this one printed for under $2 at my local office supply store! The background already has a chalkboard look, but I went over the print with a piece of chalk and wiped some off to give it a more realistic chalkboard look – I shared this tip HERE. One thing I didn’t mention in yesterday’s post is that once you have a frame made, you can interchange the different prints I offer seasonally because I’ll be using the same consistent measurements for the prints I share here. So, the frame that you make or purchase is a one time deal that you won’t have to do again and again with each print you purchase. 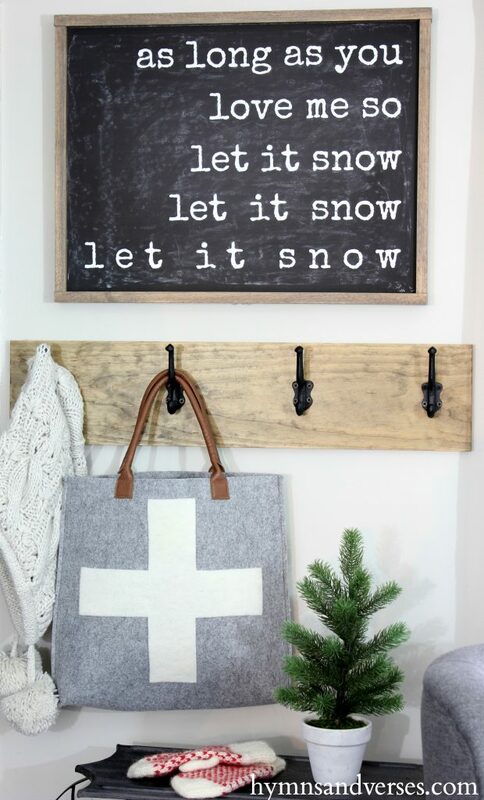 You can purchase the “Let it Snow” chalkboard print in my Etsy shop for $9.95 HERE. It is sized as an 18″ x 24″ print. 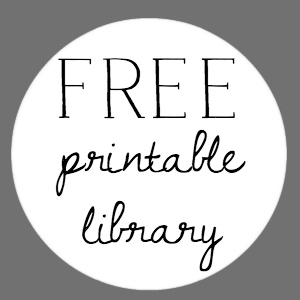 And, the SNOW printable is available in my FREE printable library for email subscribers! 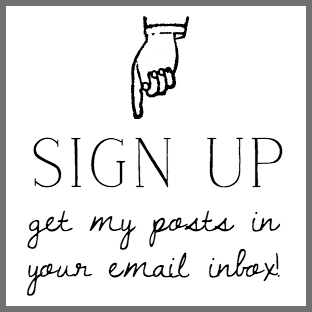 If you don’t already subscribe to my emails – why not sign up now! It’s easy and I won’t send you spam! 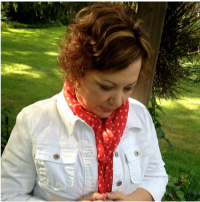 Just a few posts a week to keep you up-to-date with what’s happening here at Hymns & Verses! You can sign up below! Where did you purchase the grey cross bag? Hi, Rachel! It was actually a Target Dollar Spot purchase from a year or two ago – but, I’ve seen them in the Dollar Spot from time to time! It was plain and I added the felt cross to the front! I love the terrarium just the way it is. Those plants look so real. Nice job. 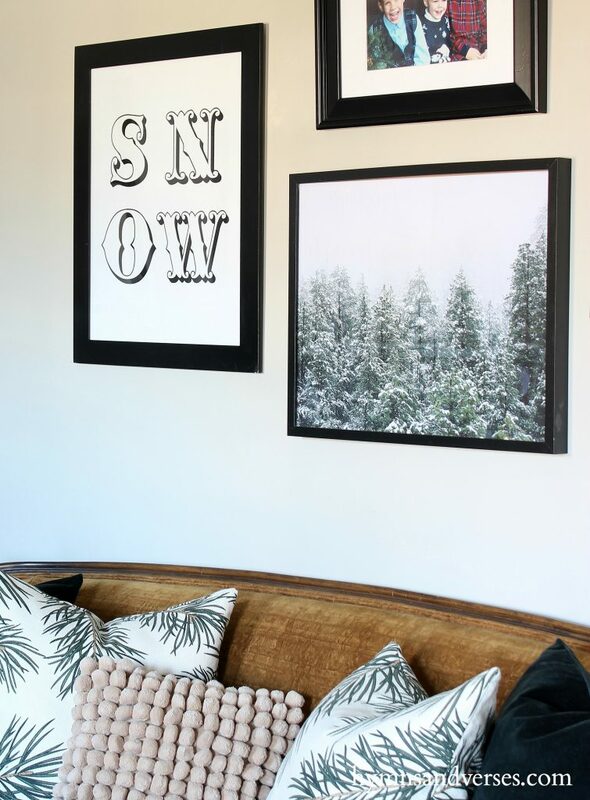 As I’m looking at too much snow falling outside, I don’t want to see snow inside, but like how your gallery wall turned out. I know what you mean! Really looking forward to Spring! I don’t have snow but we need snow in our mountains until June! I need this print! I think you can tell better about the terrarium being painted black. I say,”Go for it!” It’s not an expensive piece you can’t replace at ikea. You have one nearby! I wonder if the Hearth and Home line had a black one. I always like your visions. This room took on such a new look with forest green as your accent and the pop of crushed gold velvet. You added a hint of blush and it all goes so well together. I like the way you offer us print options. Thank you! Now I have to read yesterday’s mail!!! Thanks so much, Gwen! 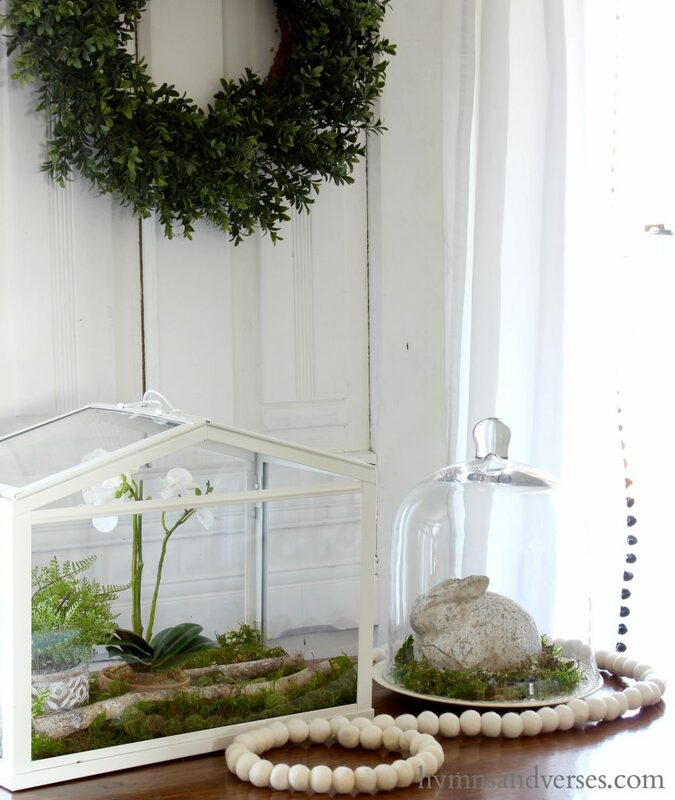 Will check on the Hearth and Hand line for a black terrarium – great idea! Thank you so much for the SNOW print. Do you have your prints printed on a certain type of paper when you get it done at cosco or the print shop? Hi, Susie! I’m so glad you like the prints! The ones I have printed at Costco, like this SNOW print, I have it printed as a photograph with a matte finish. 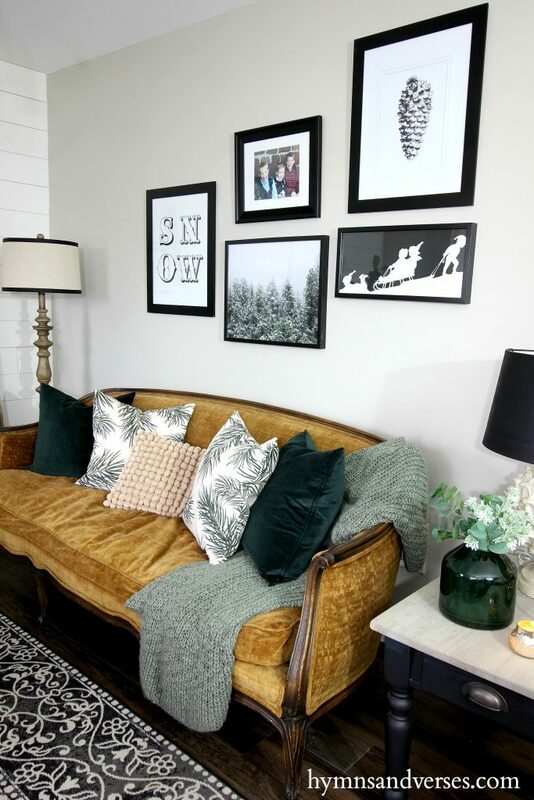 Love your winter decor and beautiful gold couch in your living room! I’m a big fan of your blog! Very nice. Thanks so much. Stay warm!